Zebra TLP 2824 Plus - Thermal transfer printing, 203 dpi, 2.25" print width, Serial and USB interfaces, Dispenser. Includes US Power cord. Interface cables sold separately. The Zebra TLP 2824 Plus: The easiest printers to load on the planet! 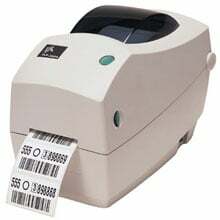 With its competitive electronic platform and now both ZPL and EPL programming languages, the Zebra TLP 2824 Plus delivers high quality barcode label printing at 3.5 ips and supports a range of options and accessories for flexible printing solutions. All units ship with one user's manual. The Zebra 282P-101111-000 is also known as ZEB-282P-101111-000	or 282P101111000	.